Sudden, quick on the draw and stunningly to the point, Sujoy Ghosh tells his powerful, sinewy story with great dramatic flair. The film zeroes in on the taboo subject of child abuse within the family and how family defends the perceived “dignity” of the adult rather than caring for the child. It is an infectiously interesting, emotionally engaging and splendidly acted drama that could disarm even the most inveterate of cynics. Ghosh’s robust directorial style, which enmeshes sharp characterization with evocative use of music (composer Clinton Cerejo is in fine fettle here), keeps the tale on the boil even during the occasional stretches where it teeters on the edge of over-articulation. However, the methods that the film uses in order to do so are rather fanciful, if not outright harebrained. Vidya Balan, at the top of her game as an actor, goes all out to inject some humungous energy into the narrative. 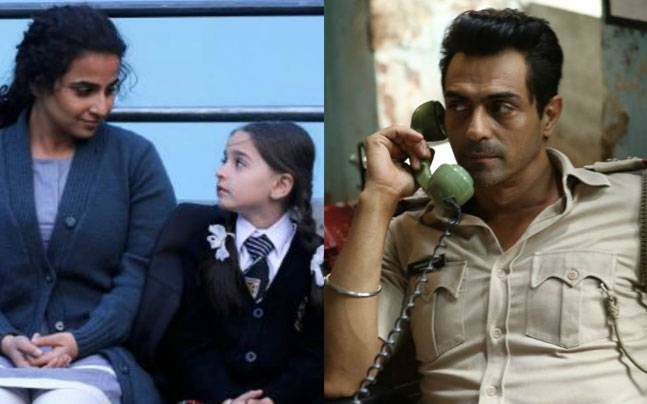 If only the games that her aggrieved character plays along with the handpicked sub-inspector (Arjun Rampal) had greater frisson, Kahaani 2: Durga Rani Singh might have been an infinitely more riveting piece of cinema. It is, at best, a terse, intriguing thriller. It fails to create the required tension, suspense or anticipation (sometimes) as the intrepid crusader leads the cops and their feckless bosses on a wild goose chase in the climax. The climax, even though reasonably well-baked and prudent, is slightly dramatic and seems to conclude the movie before clearly justifying the actions of Vidya Sinha / Durga Rani Singh (Vidya Balan) and Inderjeet Singh (Arjun Rampal), especially the latter. The momentum of the story towards the end beats its own record and the circumstances merging with the mood of the city seems to be not so much of a coincidence. Lest Vidya Sinha / Durga Rani Singh be mistaken for a common criminal seeking petty personal gains, she puts her actions in a larger context. Your mind would be tripping with a million possibilities, even as your tongue invariably ends up either tied, or hanging in the air with anticipation; Kaahani 2 is a thriller-drama with a strong message, and it is in no way connected to Kahaani (2012). Yet, it is the relentless journey that glues the various elements of the story by Sujoy Ghosh and Suresh Nair together. Because, even though we know that not everything is what it seems, we are also inwardly hoping for things to go the way we expect them to. Ignoring the convenient consequences of characters interrelated in this slice of ‘scary’ story, it is safe to say that the motives of the character, including the minor ones, are superbly drawn out. In the process we see actors once again become characters, who are resplendent as well as restrained. The result is an efflorescent, vivacious tale that pans on locations across Kalimpong, Kolkata and Chandan Nagar. The stunningly effective cinematography by Tapan Basu merits an unstinted shout out. The stylized thriller makes the most of the visceral genre that intermittently strays into fuzziness only to lift itself up forcefully enough not to lose momentum. Vidya Sinha is a working professional based in Chandan Nagar, and a single mother who spends most of her time nursling her angelic quadriplegic girl, Minnie (Naisha Khanna). When her child is kidnapped, a harried Vidya leaves home to search for her, encountering an accident and slipping into coma. Inderjeet Singh, a sub-inspector, comes to investigate Vidya’s hit and run case, and flashbacks are interspersed generously throughout the film as he flips through the pages of her cluttered diary; the diary records Vidya’s alias name (i.e. Durga Rani Singh) and a murky past of Minnie which is unspooled over a trail of scenes that involve her sticky duel with an uncle (Jugal Hansraj) and her brooding grandmother (Amba Sanyal). 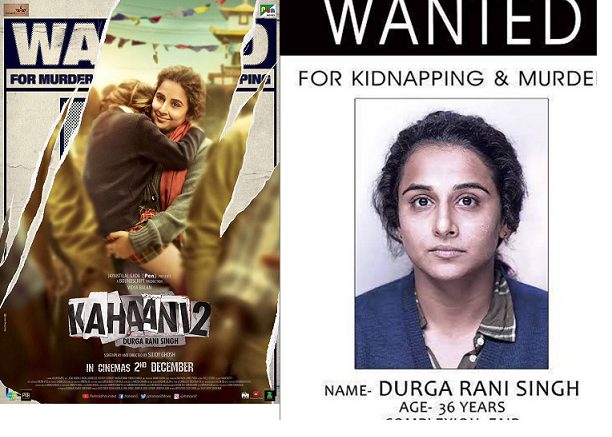 Kahaani 2: Durga Rani Singh is not easy viewing. It makes you uncomfortable; it is a stark, dark story with malicious undertones. It works as much as a cautionary tale as it does a wake-up call. The writing, by Sujoy Ghosh and Suresh Nair, is excellent, and the performances are consistently terrific. From actors in smaller roles – the senior Sub-inspector, the unsympathetic female assassin posing as a policewoman, the caring wife of a policeman, the six year old girl – to the central players, there isn’t a false note here. Arjun Rampal, on his part, is called upon to flesh out two distinct personas. He does so with remarkably subtle variations in body language and dialogue delivery. He exudes an aptly unruffled demeanour in fleshing out the character. Vidya Balan eschews much of her mannerisms and inhabits the character of a mother fighting against all odds to redeem herself – in her own eyes. Her visage, takes the form of a map of deep, tangible emotions; each twitch on the face and every flash of befuddlement or realisation in the eye is an expression redolent with the ravages she has endured. Clocking in at just two hours, this is one of the rare films that you don’t want to miss even a moment of. The movie dives deep into the mind like the director’s earlier film – to deliver a dystopian study that is at once fascinating. It is about crime, tragedy, guilt and retribution; it has the potential to repay the patience of those that don’t switch off their brains when watching a film.